Catholicism has gone a long way since it was established by Christ and his disciples. With very humble beginnings, now the Roman Catholic Church has already spread across different continents. Also, the Church has successfully expanded one of the world’s most widely-recognized and prominent religion. Its core belief is grounded unto the sanctity of the Almighty Father, Jesus Christ, the Holy Spirit, Holy Mary the Mother of Christ, Jesus’ Apostles, saints, etc. 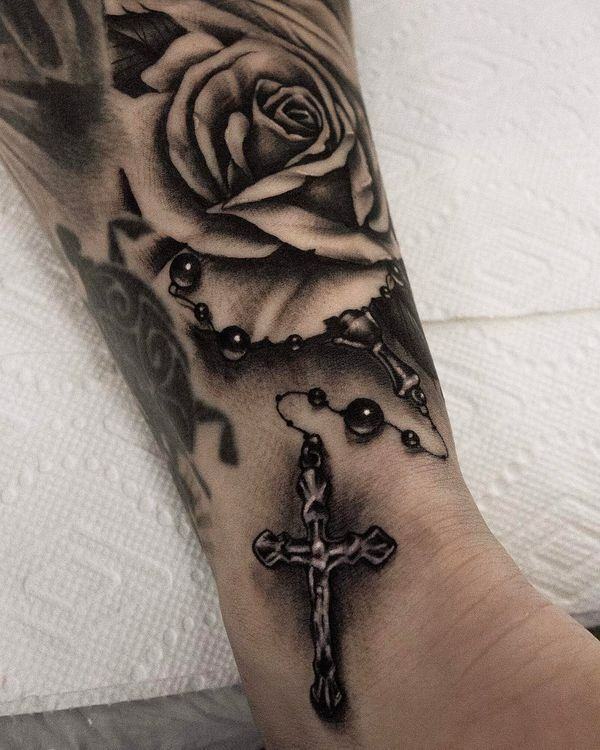 Are you thinking of getting a rosary tattoo any time soon? Hence, if you answer yes to that question, you are in luck! You know why? 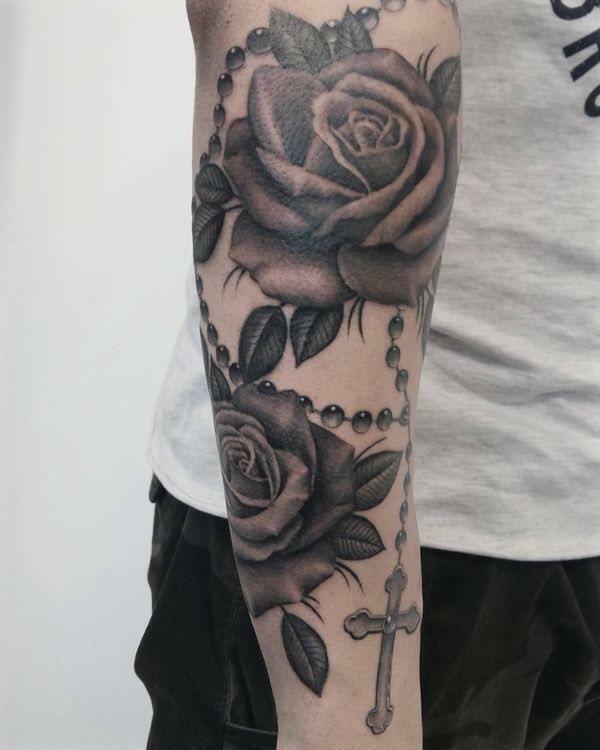 It’s because we got plenty of design inspirations for rosary tattoos for you to look at. Also, we suggest that you do your own research first before coming in to the tattoo parlor to have yourself inked. 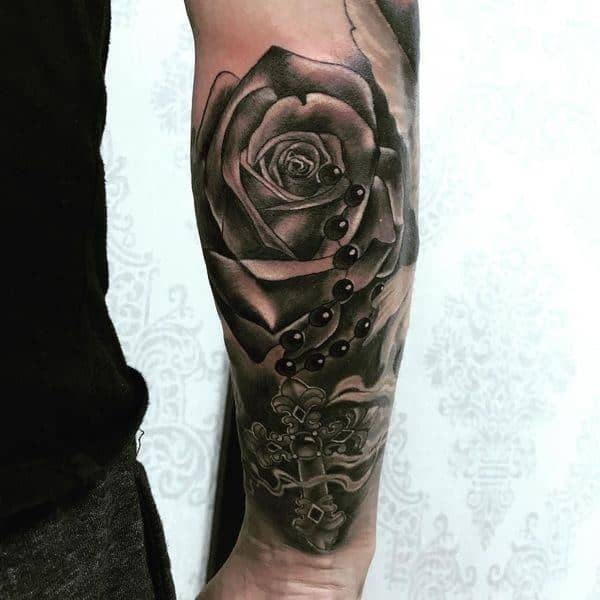 While some just choose from the shop’s catalog, coming up with your own design can always add that personal touch that makes the tattoo a lot more meaningful and special. 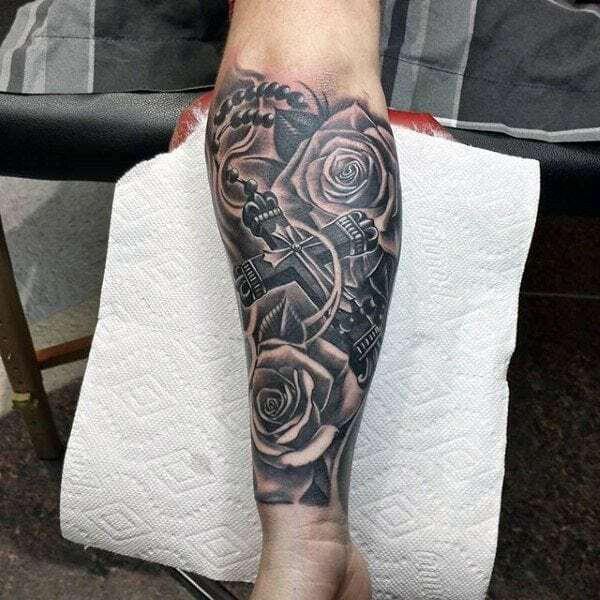 This medium-sized design at the inner arm is truly a “painstaking” work of art. Thus, the client’s pain tolerance was surely tested while the artist put all those shading details that made the tattoo very realistic. 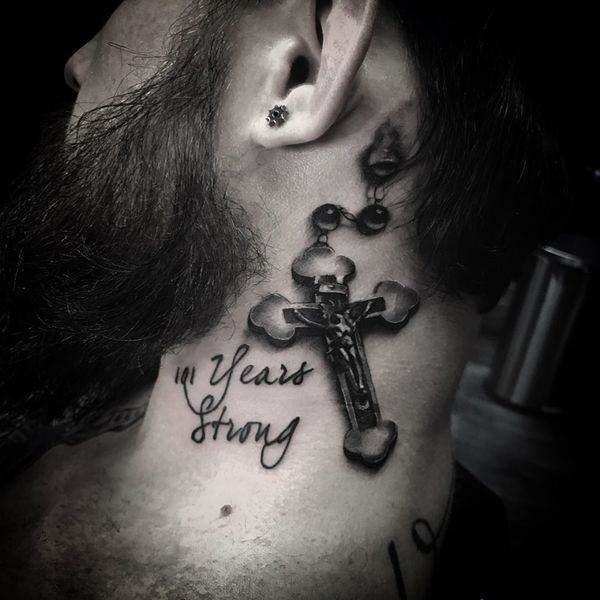 The man wearing this necklace tattoo shows his deep devotion to his faith. In fact, his passion is etched in those tiny bead details and the Celtic cross pendant was its focal point. “Always be sure of yourself if you doubt yourself don’t forget that your family and friends are there.” Hence, the message makes the perfect combination of faith and support to keep a person going. When Jesus Christ was crucified by the Romans at the cross they put a sign above his head the says “INRI.” Those four letters were an acronym that translates to “Jesus of Nazareth, King of the Jews.” Those Latin words spell the Catholic faith’s devotion to Jesus Christ’s ultimate sacrifice of dying at the cross. Using the stippling or dot-work style, this tattoo necklace is a great choice who are fond of simple and clean design. 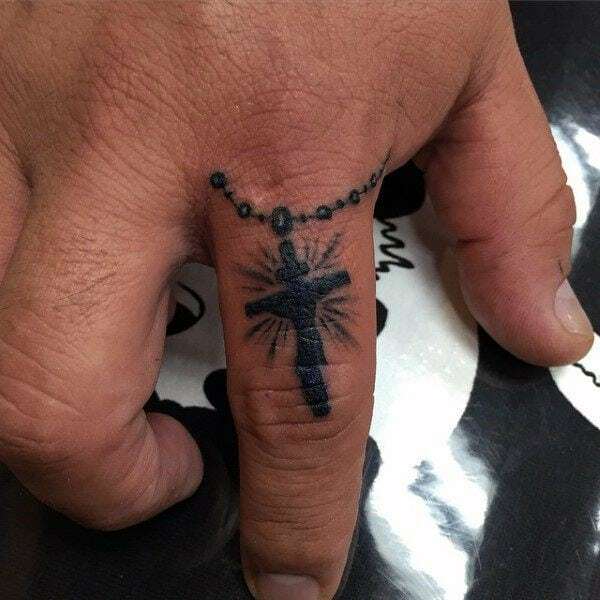 Inked at the index finger, the one we use to point the direction, is a great location to place that rosary tattoo to serve as your guiding charm. This stunning design was done by using bold and defined lines and dot-work to add details. The artist also added some shadows to provide the art with depth. The design’s clean simple lines and shades provide straightforward beautiful ink. 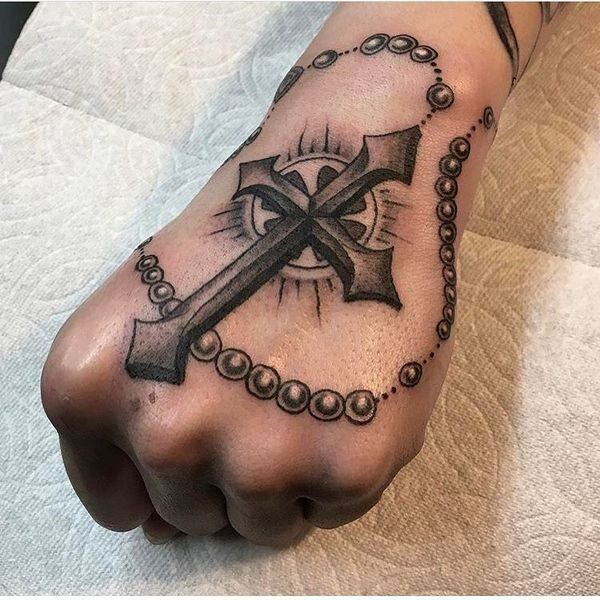 Inked with a name that literally means “bold voyager,” no need to search the world for a good rosary tattoo design because this one here is close to simple perfection. 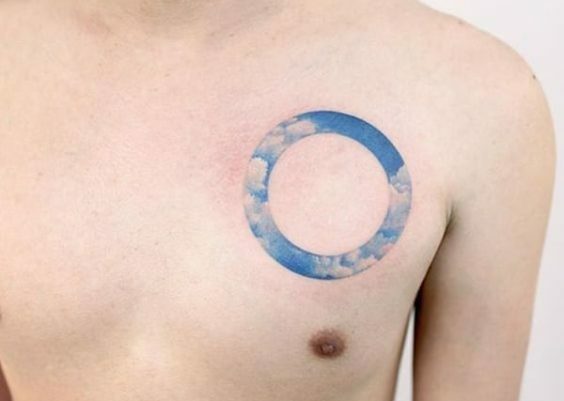 Simplicity matched with complex and symbolic imagery makes this tattoo a standout. 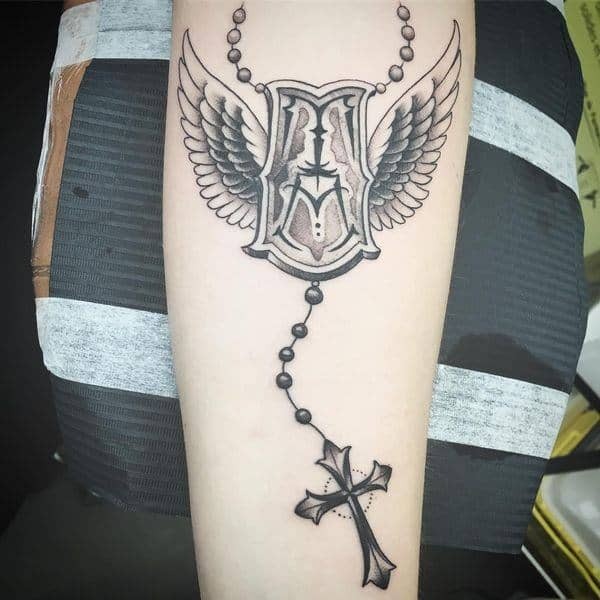 Inked at a location that’s not for the faint of heart, what’s not to love about this rosary tattoo with an angel wings medallion centerpiece? 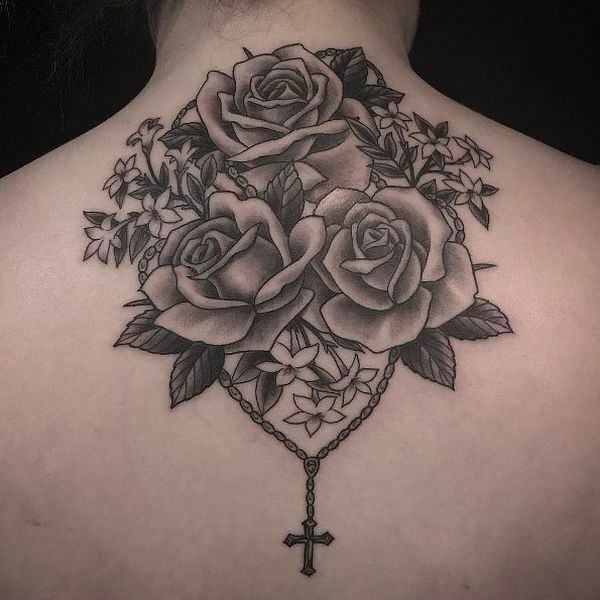 Flowers and Faith go well together, especially in this nape tattoo design. 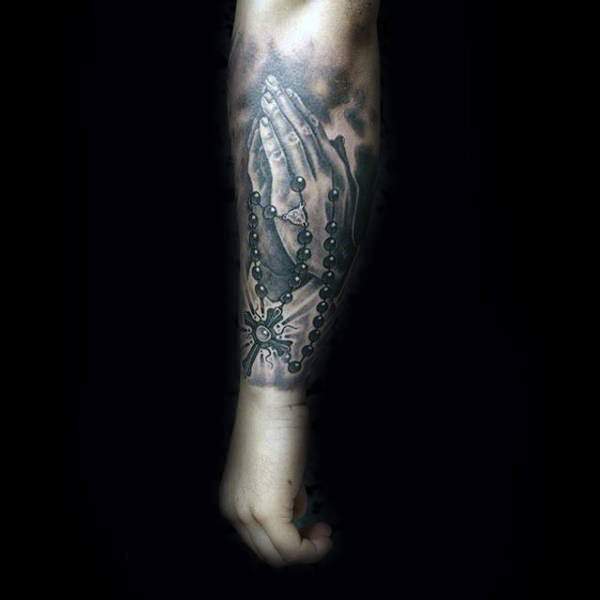 Rosary tattoos at the forearm are far from being cliche if you add a meaningful message to accentuate the design. 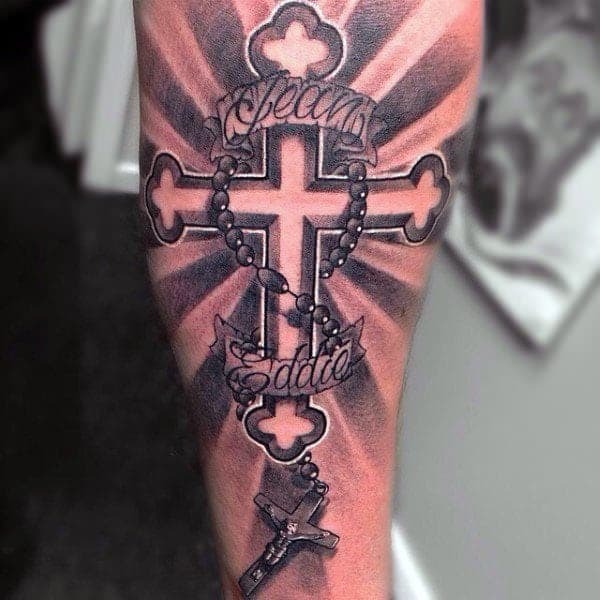 A grayscale neo traditional rosary tattoo wrapped around a shining crucifix etched at the forearm is testament to Jean and Eddie’s faith-centered love. 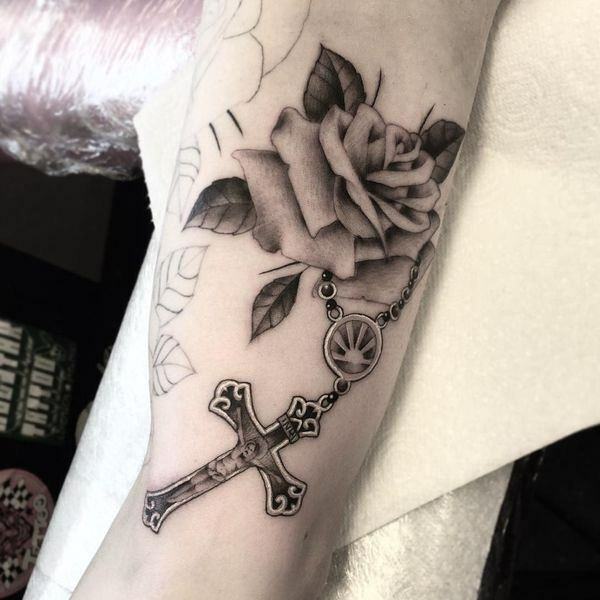 Forearm tattoos are easy to spot. 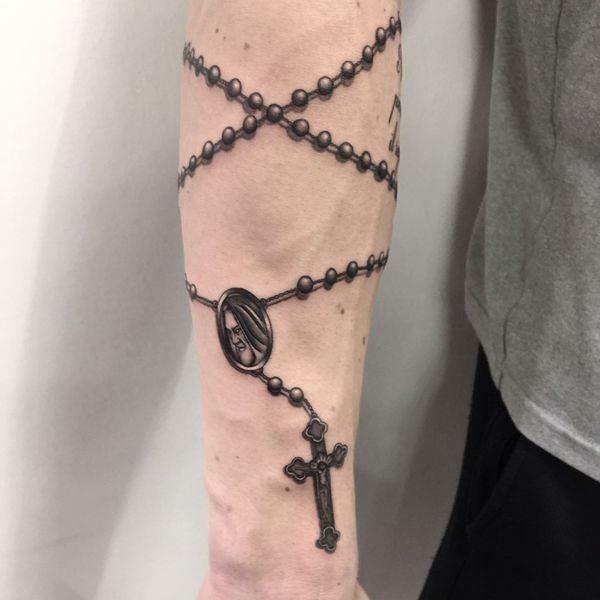 Thus, this guy gives others a nice piece to stare at with this interesting rosary tattoo composition. It’s hard to go wrong with neutrals like gray and white. 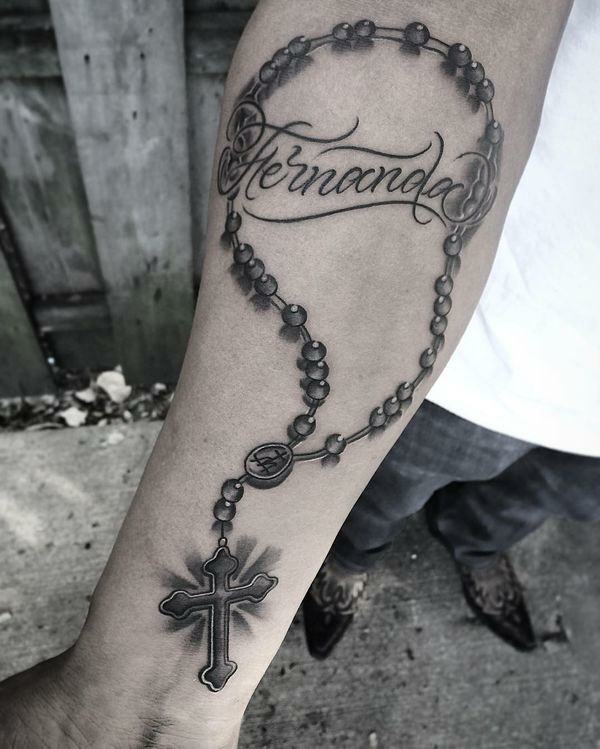 Hence, adding elements of white ink to make the artistry pop, this rosary tattoo design is a cut above the rest. 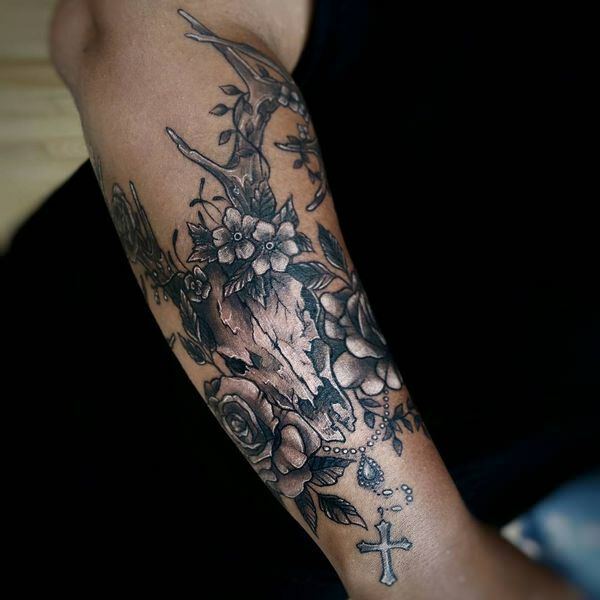 Hypnotic, unique, and intriguing are just a few words to describe this rosary tattoo design that shows an overgrowth of flowers on a crumbling deer’s skull. Faith represents the core of a person’s being. What they believe in tells what matters most to their life. 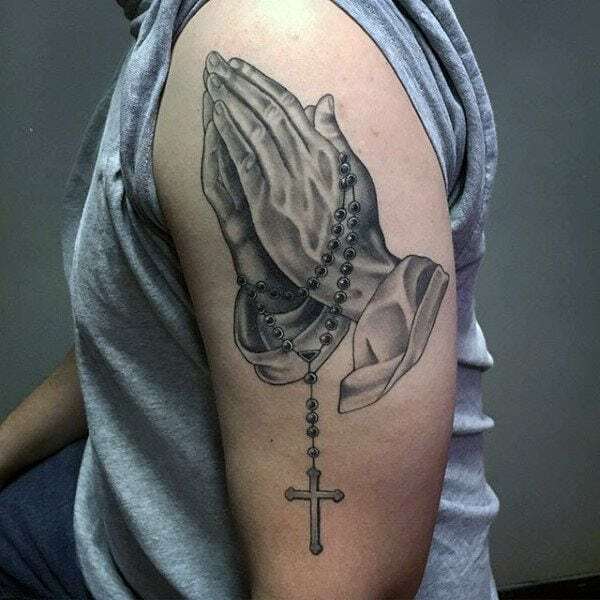 Wearing a rosary tattoo on your body tells the world your devotion. 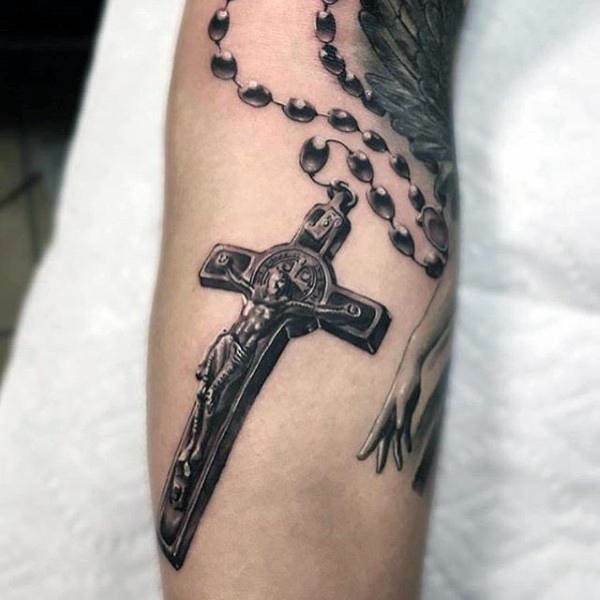 Just like this rosary tattoo design, it goes old school and traditional, while featuring a classic religious symbol that’s been around for hundreds of years. 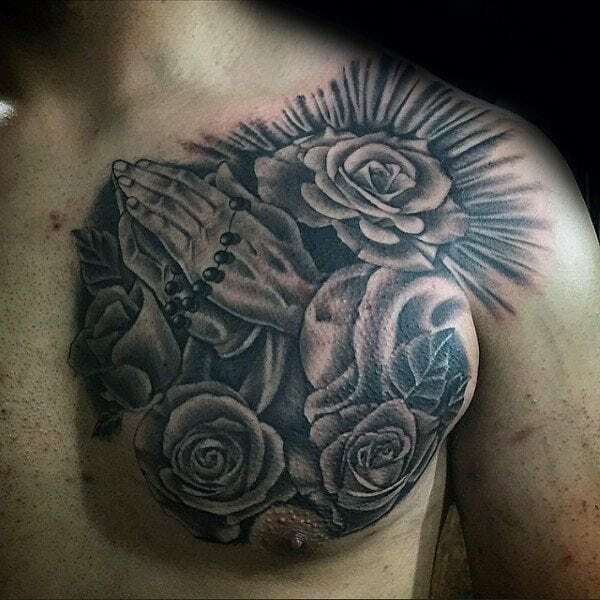 It’s a large design that covers the upper left side of the chest up to the rib cage. 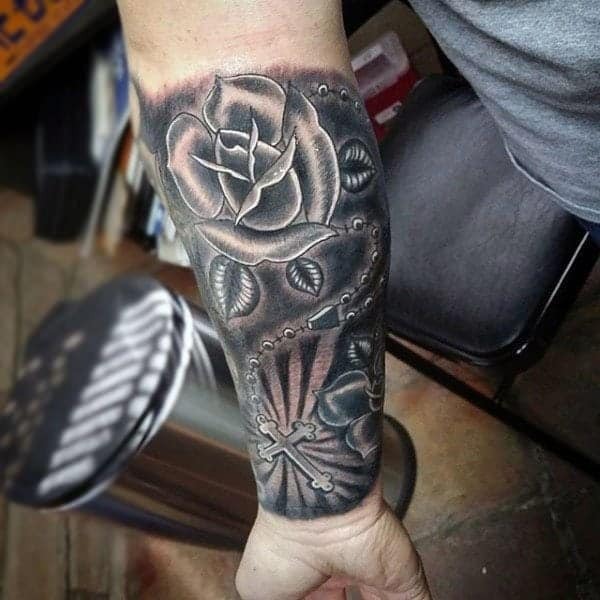 Hence, this design is a symbol of the guy’s devotion to withstand the intense pain that comes with the artist’s labor of love. 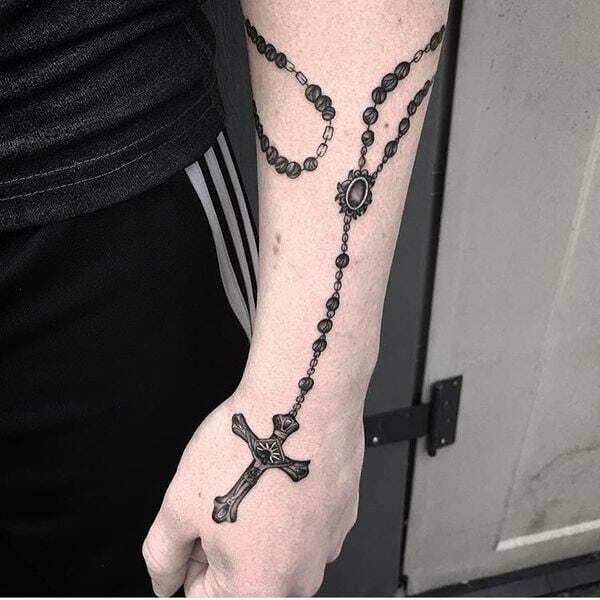 Almost like a part of an old black and white painting, the artist’s work in this forearm rosary tattoo spells genuine artistry. 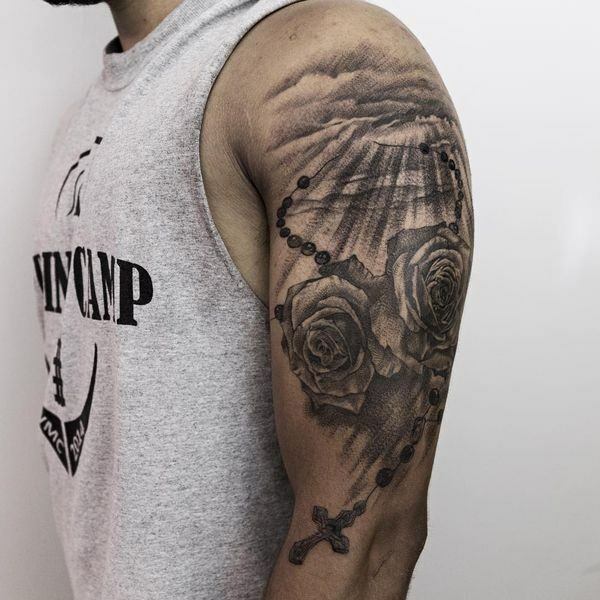 The skill in this tattoo art can pass for a mural at the Sistine Chapel in Italy. 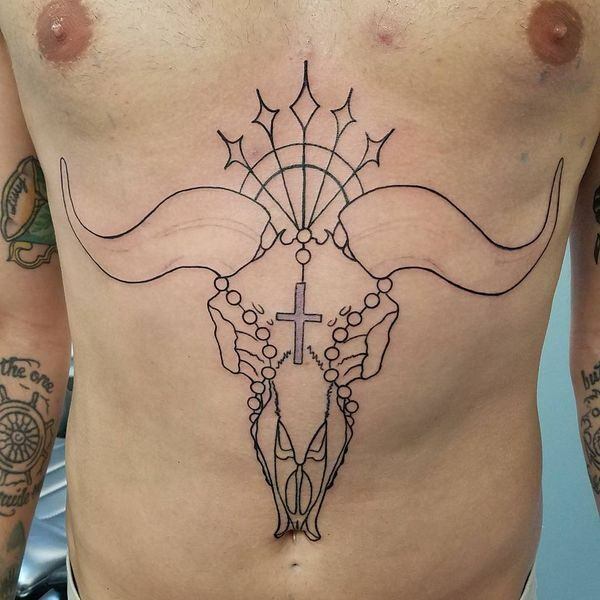 Inked at the left side of his chest, here’s a design that expresses beauty, love, and faith, even without saying a single word. Black and white are opposites but they work together very well. 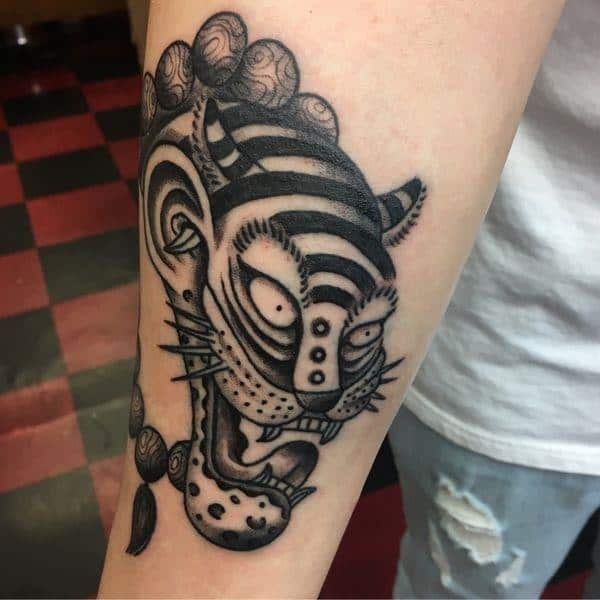 This tattoo design is just proof of that fact. 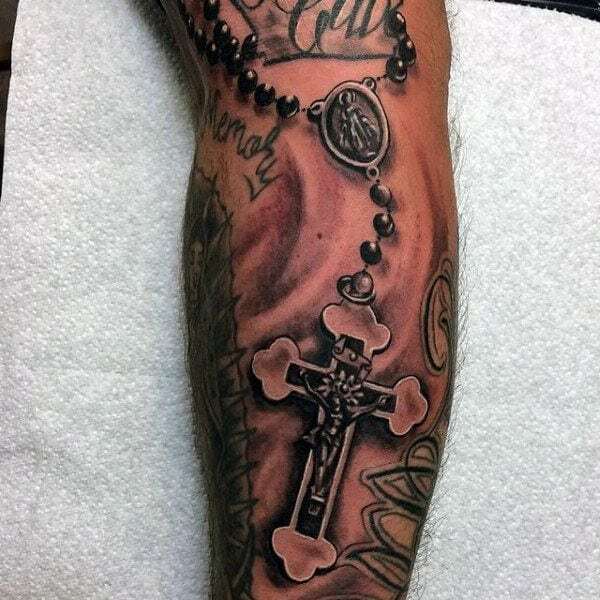 Meanwhile, wear your faith on your sleeve with this rosary tattoo wrapped around the forearm. To wear a tattoo of this size, this guy have the guts and the pain tolerance of a champion. 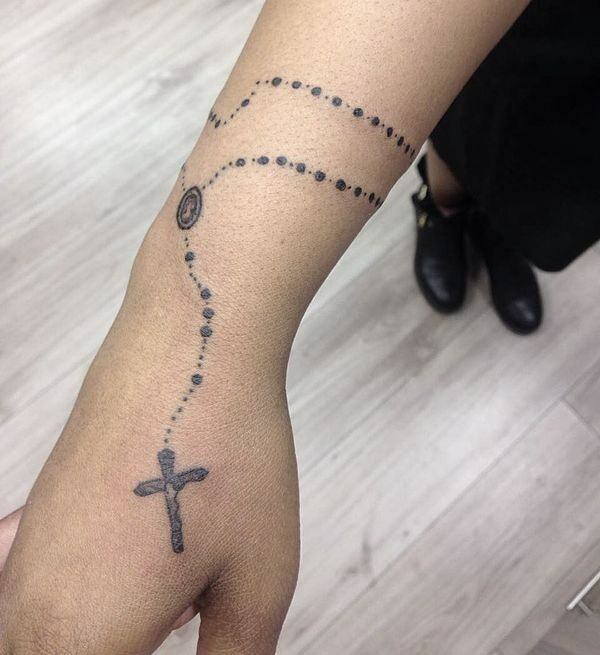 Be inspired with this uncomplicated and traditional style tattoo with rosary accent. Neck tattoos carry extreme pain. So, those who get them have the greatest tolerance and strongest will to overcome the pain for the sake of art. 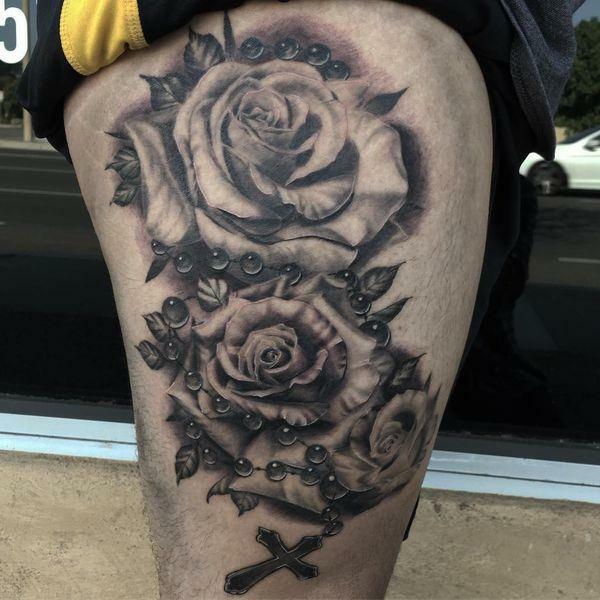 Offering flowers at the altar is a common practice, but getting inked in the name of your Catholic faith is a whole new level of devotion. 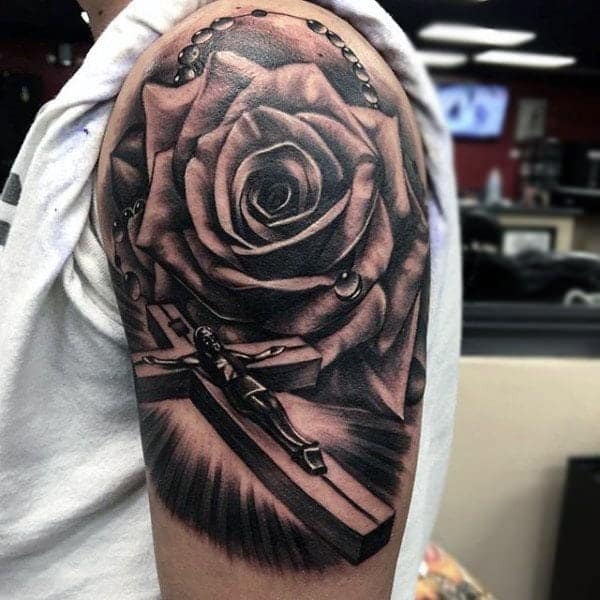 Capturing images that depict time, mortality, faith and beauty, this upper arm tattoo is a conversation starter. 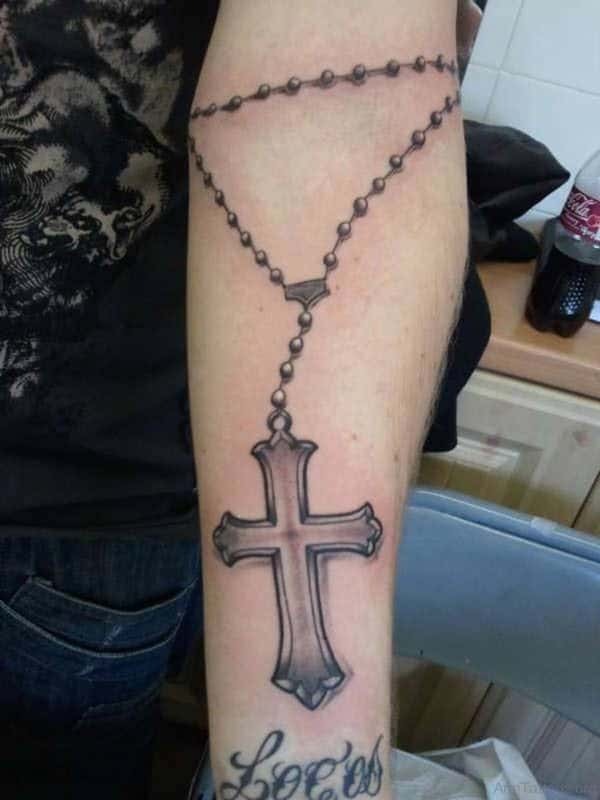 Wear your religious pride with a symbolic tattoo with a rosary. 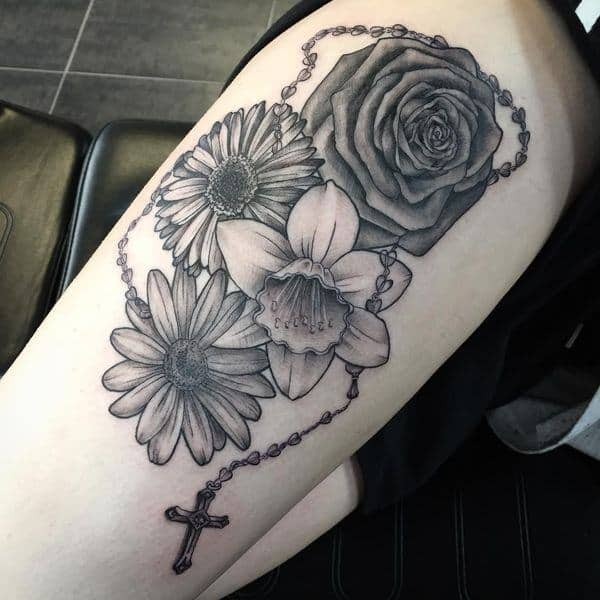 Inspired by the double exposure technique in photography, look at how this rosary tattoo design creates a solemn image of this person’s faith. For tattoo work, the more precise the details, the better. 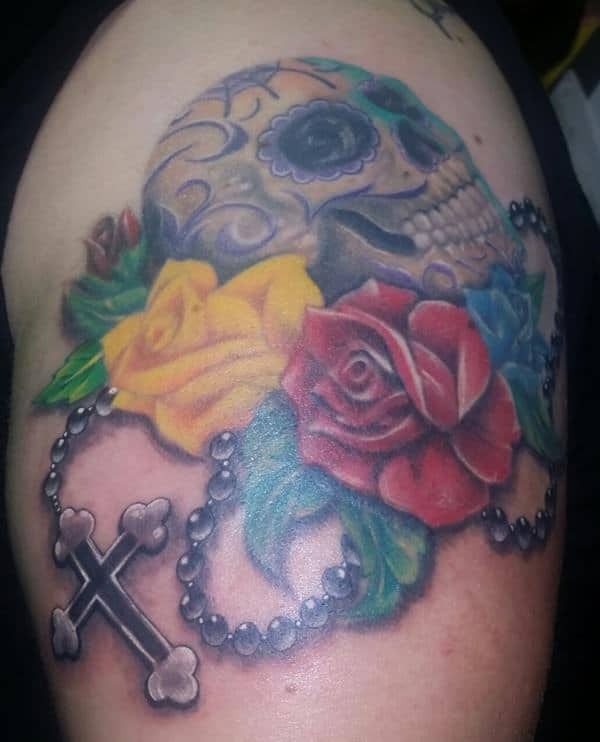 There’s no shortage of skill and talent for this guy’s tattoo artist. 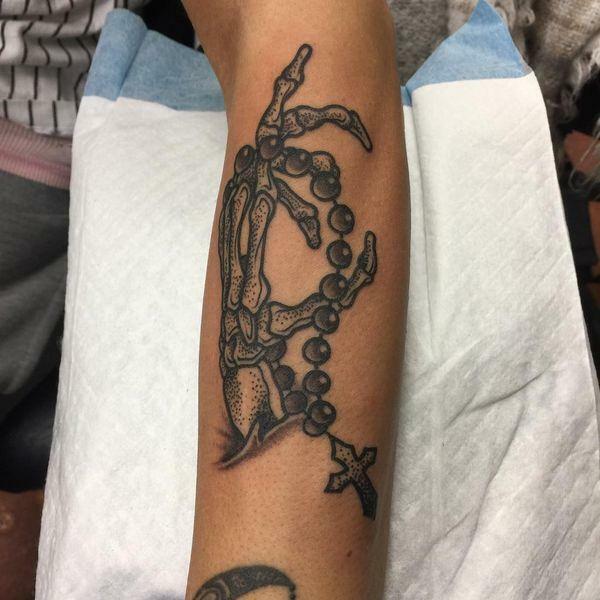 Take a look at this rosary tattoo that’s inked with precision. 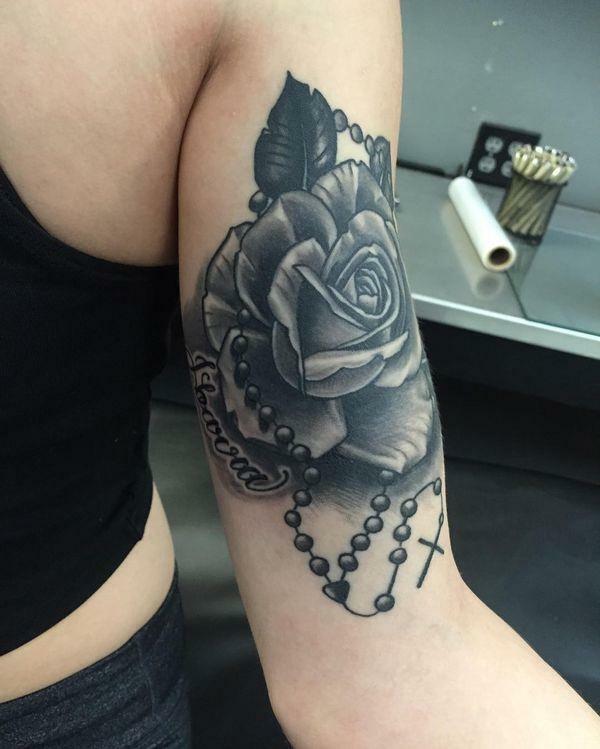 By adding shadows to the design, it gives the rosary tattoo more depth and dimension. 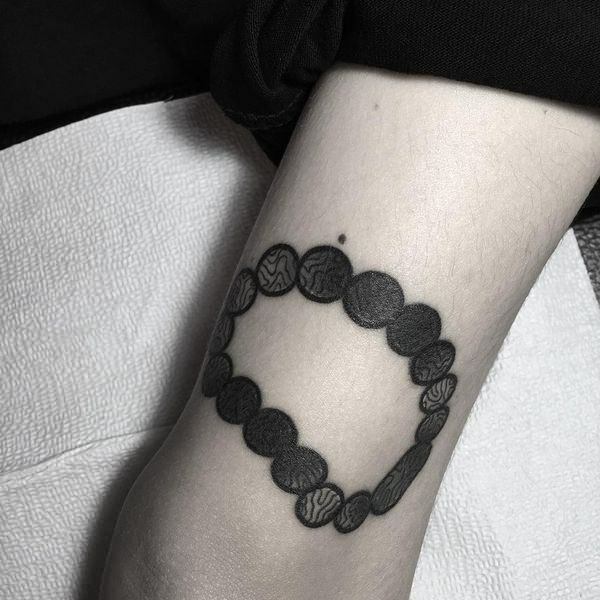 Worn around the wrist like a bracelet, this pretty tattoo is the perfect accessory. 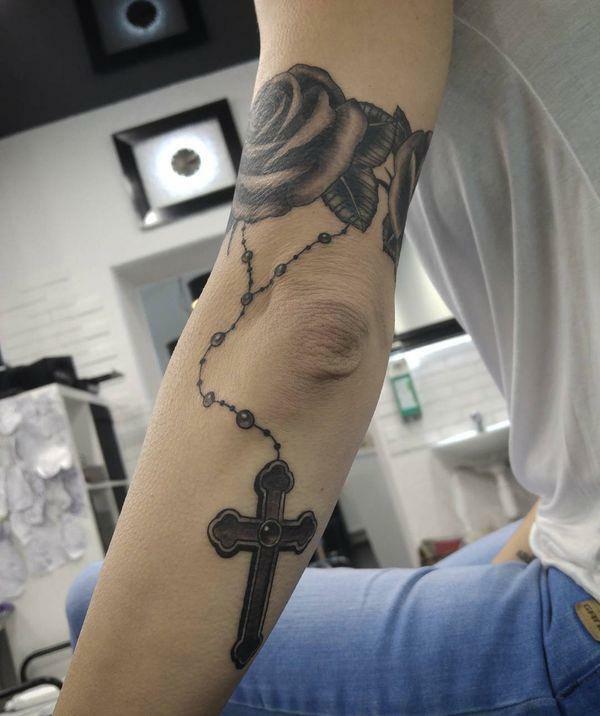 Turning to classy imagery with fine lines, this lady’s arm tattoo exude charm. Also, messages like “Trust in the Lord” and “Love never fails” will always ring true for the rest of time. 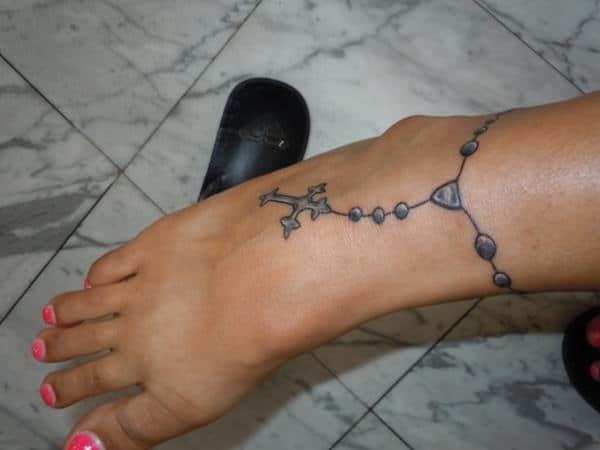 In an attempt to mask an old and irrelevant tattoo, this lady got herself inked with a pretty rosary-designed anklet. 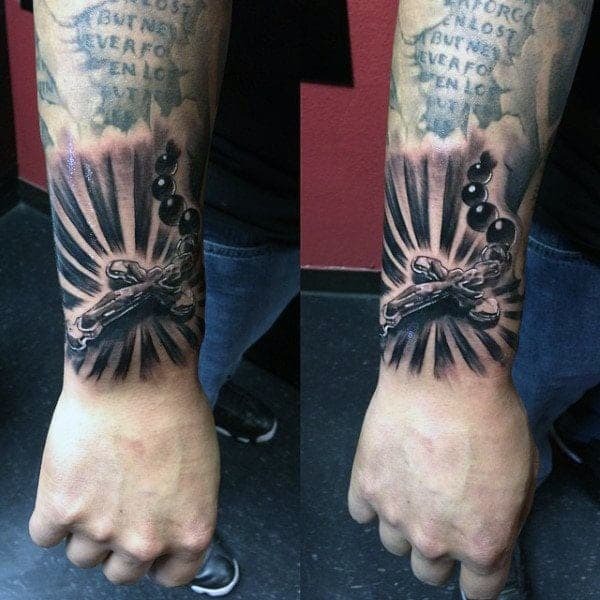 Sported at this man’s left forearm is a black and gray rosary tattoo, with large spherical beads with shadow details. The crucifix is a reminder of Jesus Christ who died on the cross for the world’s salvation. 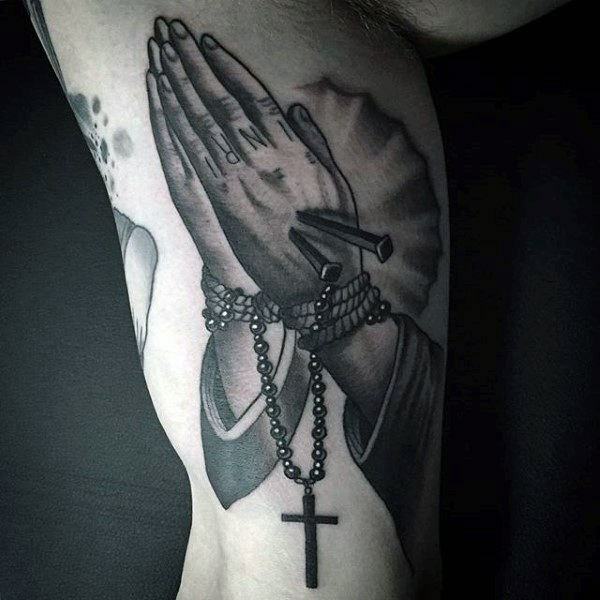 This huge thigh rosary tattoo is like a black and white oil painting on a canvas. 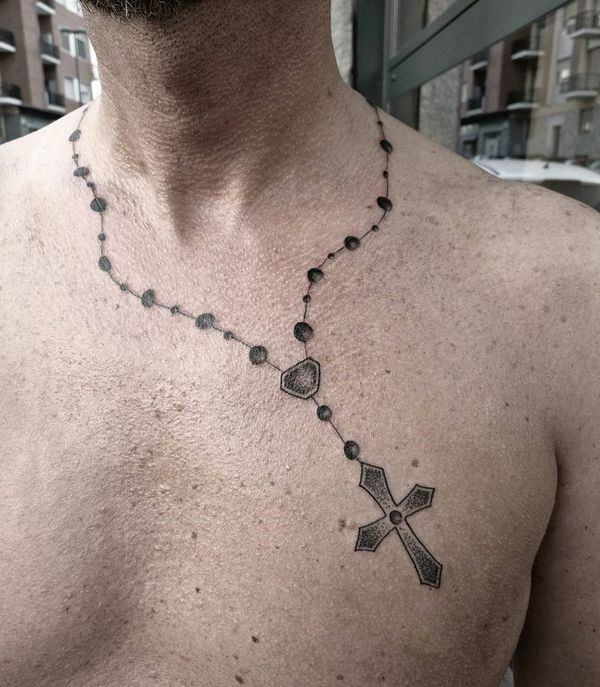 The cross is the focal point of this rosary tattoo. Also, it depicts Christ’s ultimate sacrifice. 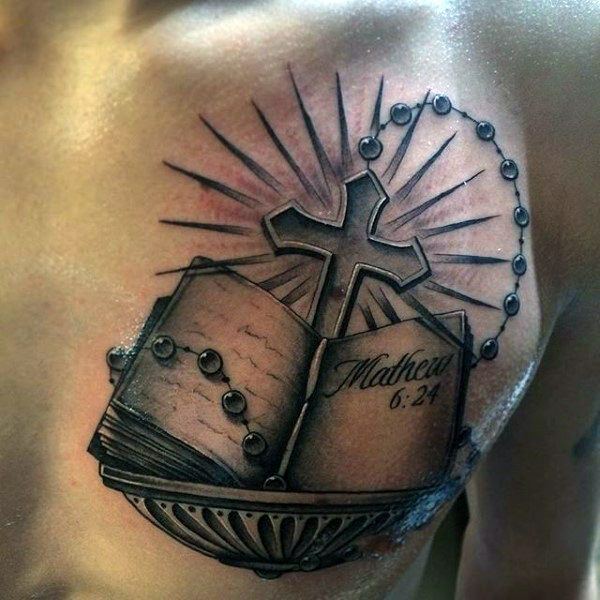 This rosary tattoo is exceptional because of its grand cross and Holy Mary medallion centerpiece. This traditional tattoo shows how adding vivid color can always make a tattoo come to life. Want to keep it simple but can’t bear to look plain? 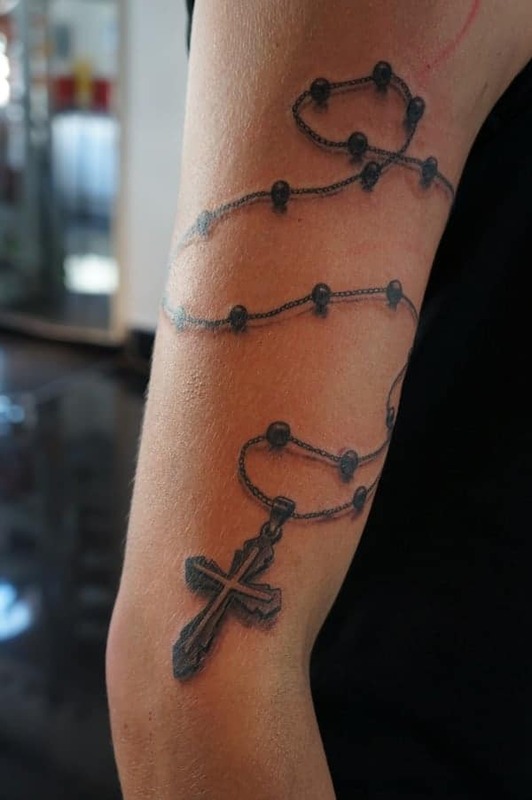 Then, add white ink to give your fine line work rosary tattoo a twist. You don’t need to shout to express your love for your religion. 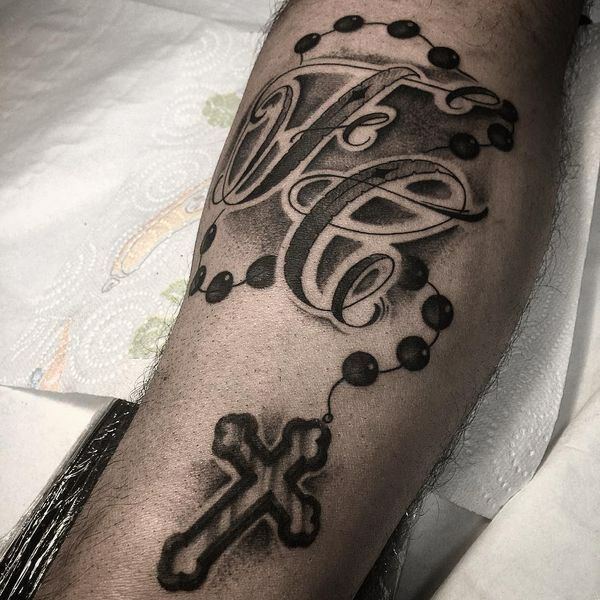 Likewise, a rosary anklet tattoo can speak for itself. May I ask you, are you walking Christ’s path? Do you live by His Words and His Ways? 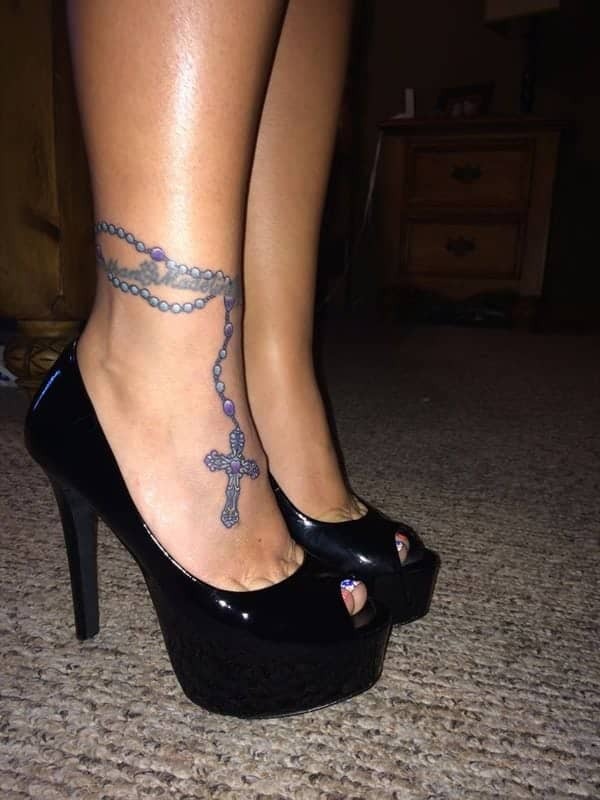 If you’re all for displaying that passion, get an ankle rosary tattoo to show how much you’re proud to be a Follower of Christ. 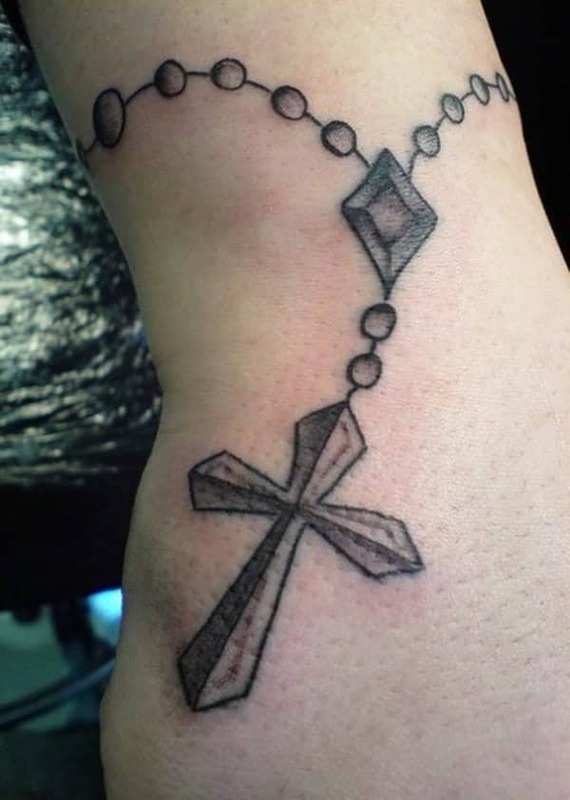 This lady’s fine line work anklet rosary tattoo demonstrates her devotion to Jesus Christ. It’s a very simple composition. 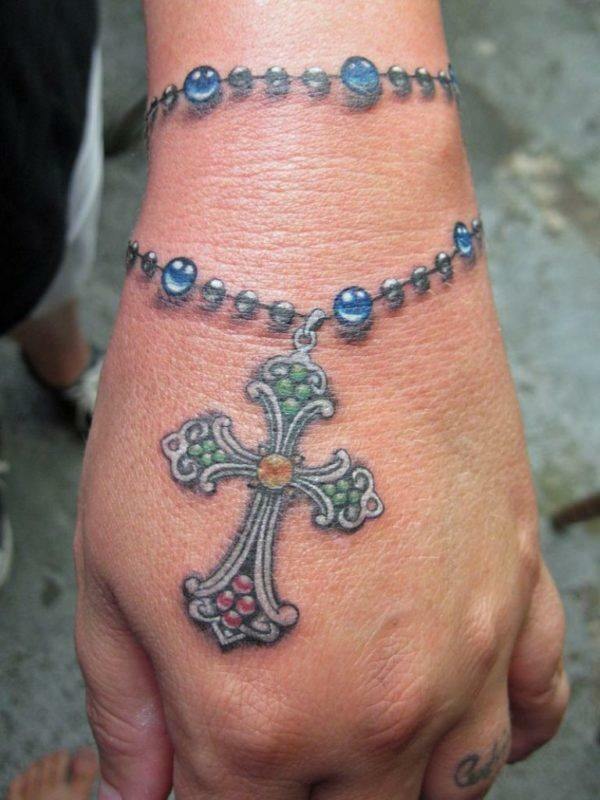 However, the artist’s precision and great color work makes this rosary tattoo win our hearts. The rosary guides Catholics in prayer. Meanwhile, at its core is the mystery of Christ’s life and resurrection, intertwined with his Holy Mother’s blessed life. Some guys are wrist watch kind of guys, but this one is definitely a rosary wrapped around his wrist kind of man. 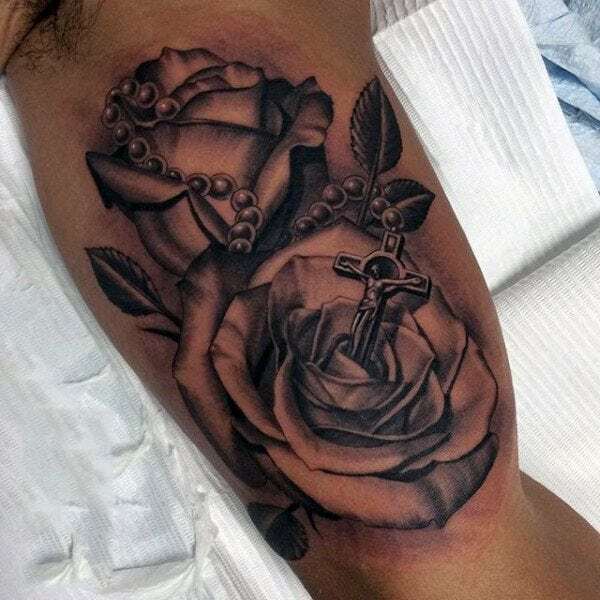 Traditional style tattoo in Graywash color featuring a rosary and a rose. 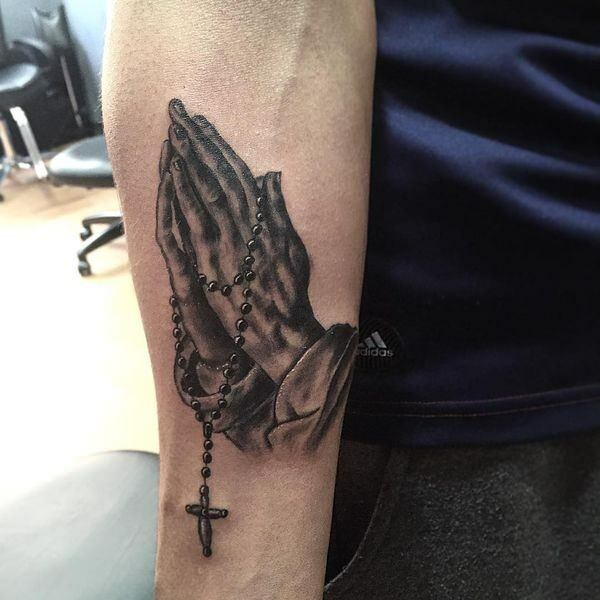 The contrast of the dark gray shades with this person’s light skin tone make the tattoo design standout even more. 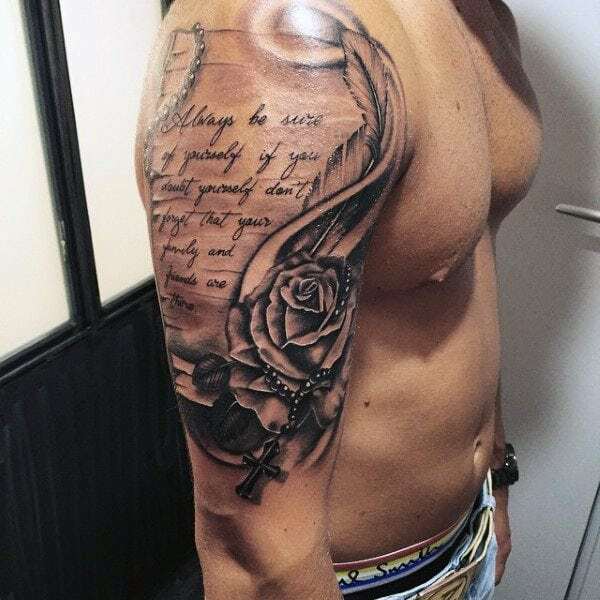 This half sleeve sketch tattoo of the rays of light coming from behind the clouds, a couple of roses, and the Holy Rosary is this guy’s shining statement of faith. 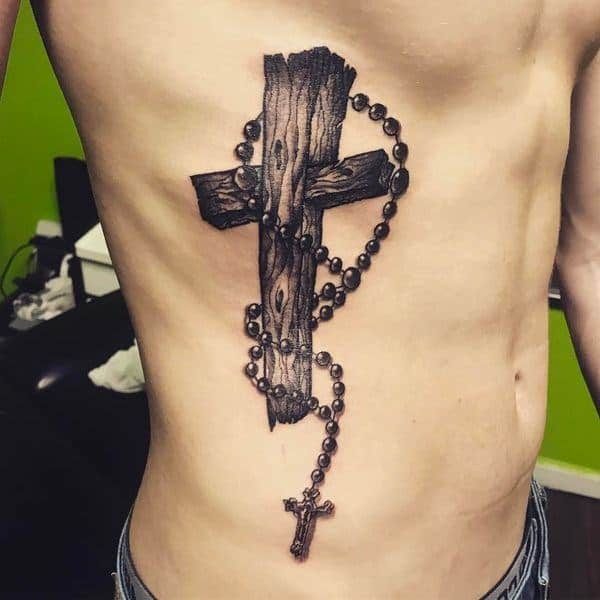 Inked at the side of the body just on top of the rib cage, this rosary tattoo brought the most extreme pain to the person wearing it. However, his religious devotion helped him overcome it. Hence, the captivating masterpiece proves worthy of the sacrifice. How much does a person know about the life of Christ? 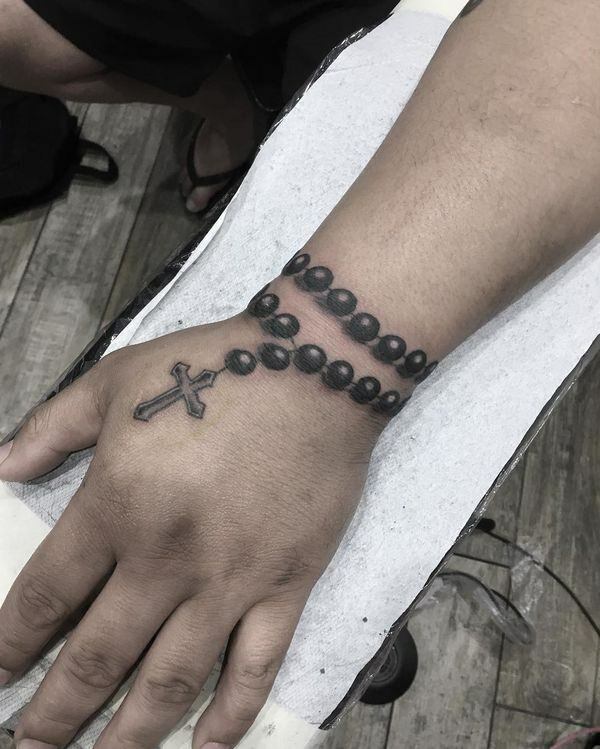 Thus, to serve as a reminder to always seek His Way, a hand rosary tattoo like this will help see you through every day. When is a good time to pray? Any time and any day. Also, the rosary is a daily devotion to help Catholics show their strong belief in the power of prayer. When you are introduced to person for the first time, the person you meet can tell a lot about you with just one handshake. 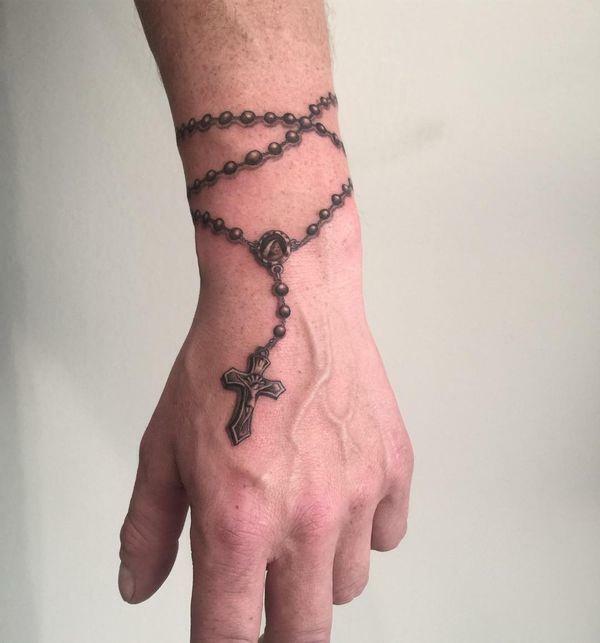 Thus, a forearm rosary tattoo sends a pleasant message ahead for you. You don’t need to go to church to say a prayer. God is everywhere, so speak your faith any time and any where. 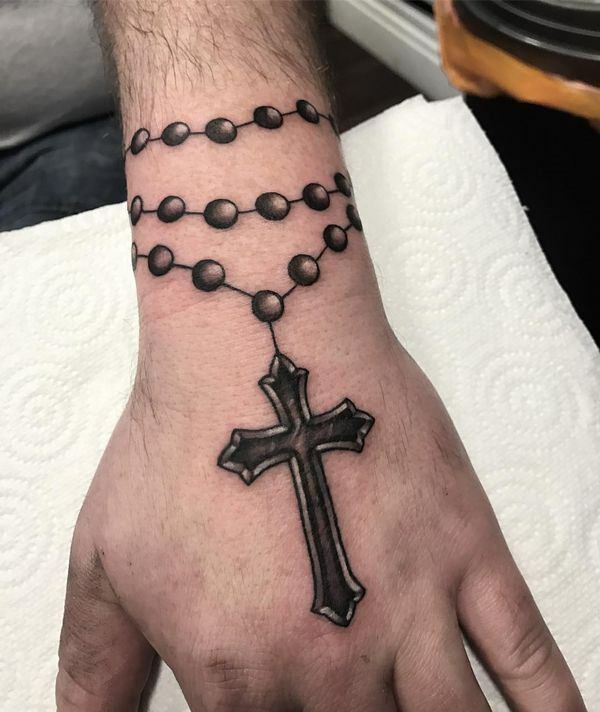 Meanwhile, you can carry a rosary around wherever you go by getting one inked around your wrist like a charm bracelet. The grains in the wood define its beauty. Hence, to use wood for rosary beads promotes a unique and chic appeal. 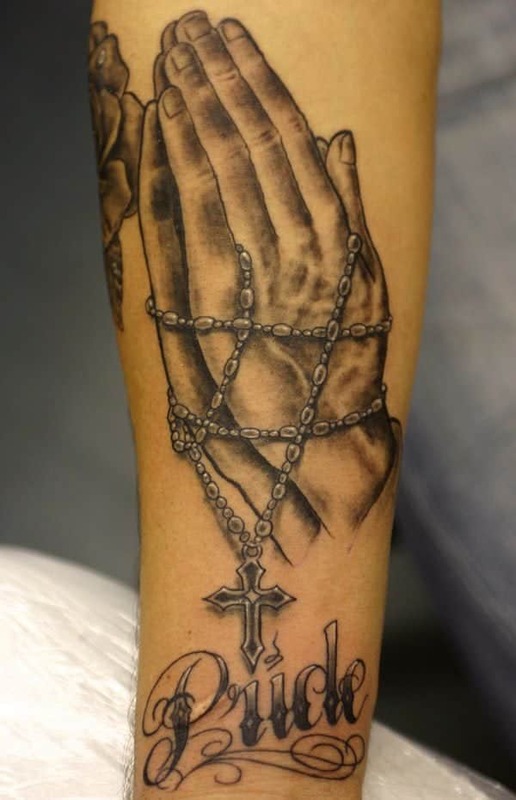 Likewise, bold lines that mimic the grains of wooden rosary beads keep this tattoo design interesting. What we see here are four different flowers drawn to perfection. 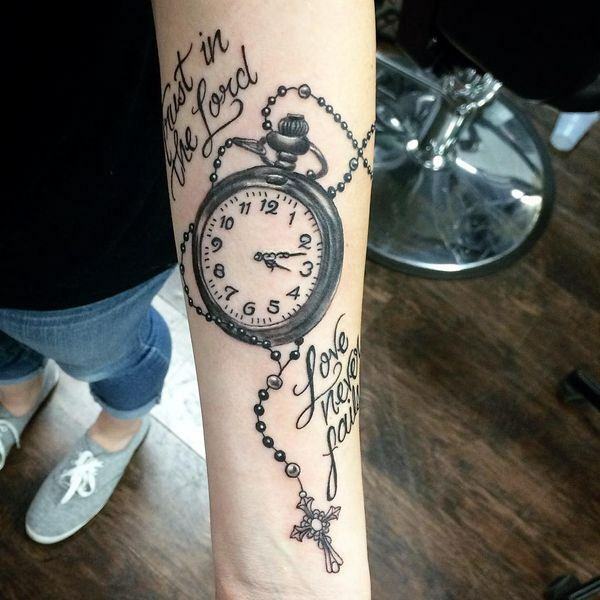 We’re definitely in love with this black and white sketch tattoo. 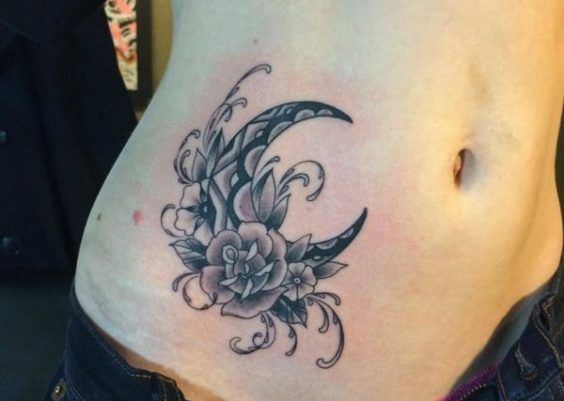 It’s dainty and feminine, but also meaningful and inspiring. Irezumi has been around in Japan and Asia since 10,000 BC. 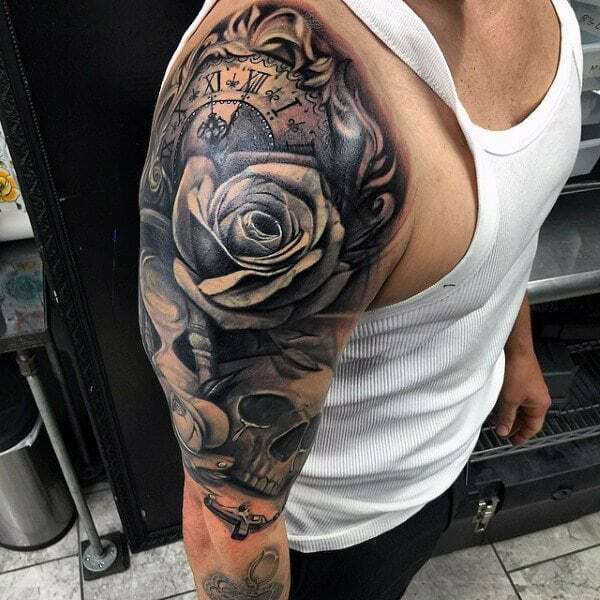 At present, the tattoo technique has since spread all over the world. 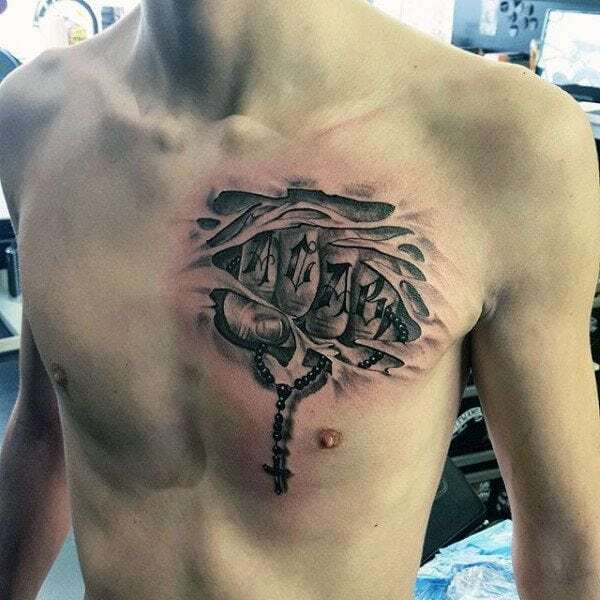 A proof: Here’s a fierce-looking Traditional Japanese-inspired tattoo art with a rosary bead necklace. Got something you want to let out of your chest? This tattoo seems to say just that. We’re drawn to its surrealism. It’s like ripping off the chest’s skin from within with a clenched fist holding a rosary. 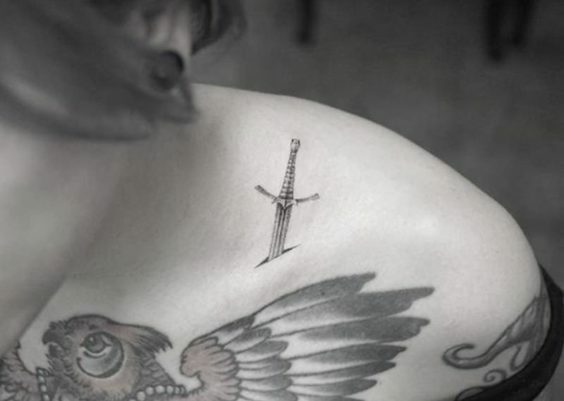 We love the details of this tattoo. 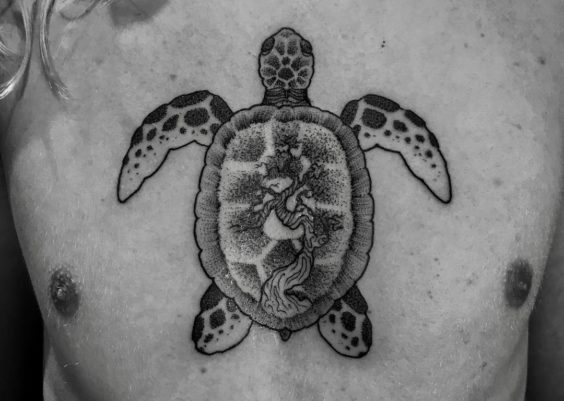 We’re all for the contrast of black shades with tiny specks of white ink here and there that added life to this skin art. Dots aren’t just for the Morse Code. 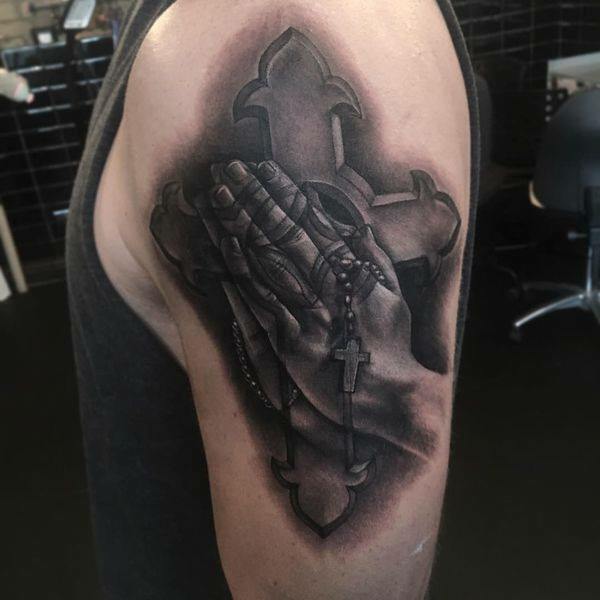 Show off your faith with this kind of minimalist tattoo design. You don’t need huge and complicated designs to broadcast your pride. We’re used to seeing sketches on paper, but this work of art uses skin as the canvas. 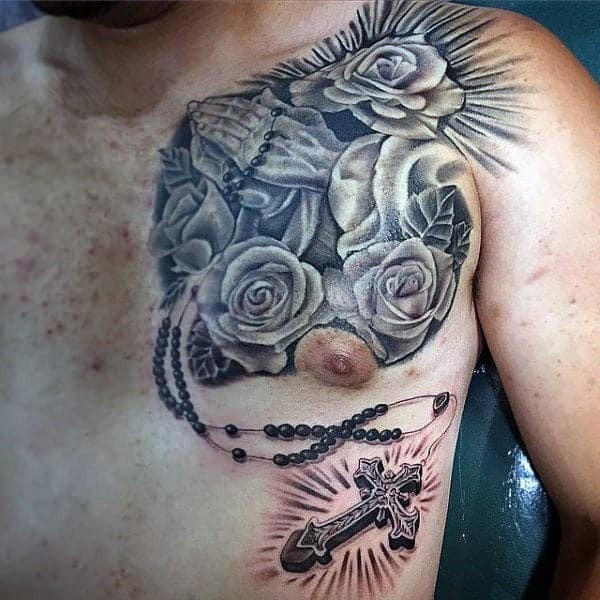 Painted like a true sketch artist, this rosary tattoo depicts beautiful faith in the Mysteries of the Holy Rosary. So what’s in a rosary? It is made of beads that represent one prayer that one can utter or say through their mind. Likewise, praying the Holy Rosary relives the Joyful, Glorious, Sorrowful, and Luminous Mysteries of the Catholic Faith. 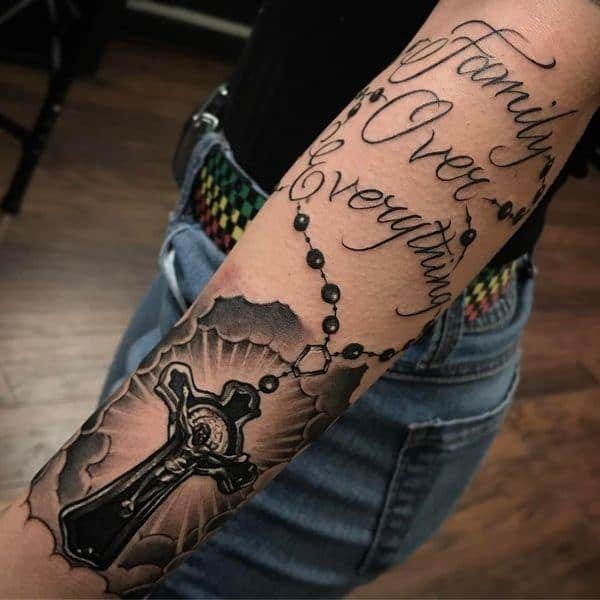 Whether you are a devout Catholic or just a faithful believer in Jesus Christ, you’d find that rosary tattoos bring out the best in your character. Also, a tattoo is an everlasting expression that tends to give meaning to you as a person. Therefore, choosing a religious symbol like a rosary exudes your faith. 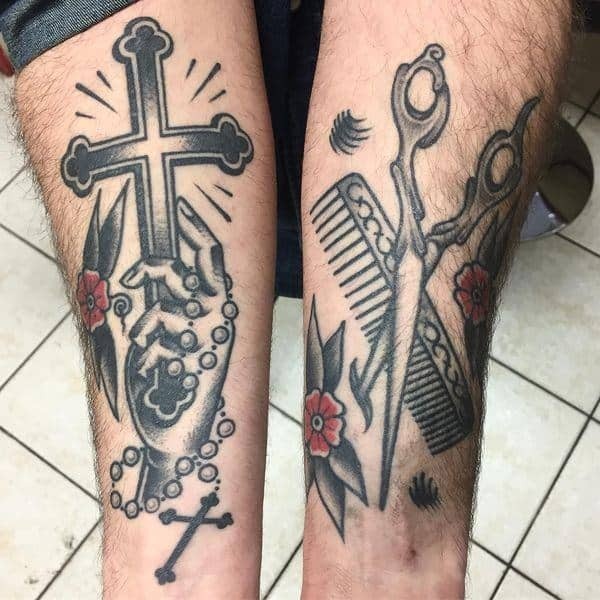 Thus, before heading out to get inked, think about which of these rosary tattoos inspire you the most, or feel free to design your own.